I have actually just started the expensive skincare routine I introduced about a week ago but I thought I'd show you the evening routine I was following just before this. Some products I'd been using for a few months and some had been switched round more recently. Before last year I'd never heard of a micellar water, and even though I had heard of them by the time I took part in the Escentuals micellar blind trial, I hadn't actually tried one for myself. Now I have tried micellar waters I'm not sure that I would go back to using anything else to remove my makeup. I do have quite sensitive skin and it is often aggravated by removing my makeup, but so far I've found that Bioderma Sensibio and Caudalie's makeup remover cleansing water are perfect for my skin. I use this to remove my makeup, or if I've not worn makeup that day I use it just to remove the days dirt and grime before the rest of my routine. I just love this stuff, so much so it made it into my top 5 skincare products of 2013 (you can find the post here). Oh and Bioderma also made it to my top 5 as well. I bought my mum the You Beauty balance Me box for Christmas and inside was an offer of £10 to use on the balance Me website, so I treated myself to this smaller size tube and as it costs £10 I just paid the postage for it. This makes sure every last bit of makeup has been removed and leaves my skin super smooth and polished. This came as part of a Clinique 3 step skincare set that my boyfriend decided to buy me when Debenhams were running an offer on beauty. Before this I hadn't actually used a toner for years as I decided to stop using them thinking they may be too harsh or drying for my skin. I stopped using this for a while when one of the products from the set ran out but I decided to add it back into my routine recently. I like that if my skin is a bit dry and flaky this will sweep away the flakes and therefore make it easier for my moisturiser to absorb. This is actually an old favourite that I've recently rediscovered. Like many people I was reluctant to try a facial oil at first as although most of my face can get really dry and flaky my chin is oily, so I thought applying an oil to my chin would just make it worse. It actually works the other way round and using this on my chin balances it and makes it less oily. This is great for adding extra moisture to your skin, evening out your skintone, adding radiance and reducing blemishes and scaring. The third balance Me product in my current routine! I use a light moisturiser in the morning but at night I prefer to use something heavier to try and make sure my dry areas get the moisture they need through the night and this does the job. To be honest I'm not sure if this does very much for my industrial strength dark circles (but then nothing does!) but I keep up using it to try and make sure they don't get any worse if I stop using it! Any recommendations for a reasonably priced eye product that works miracles on dark circles? I did recently find a great product that worked well for me but unfortunately it wasn't cheap. Although I won't be trying any more Philosophy products after I experienced a bad reaction to their purity cleanser (and discovered that there's a warning on the back of their bath and shower gels warning against prolonged use) I do use the Kiss me tonight moisturising lip treatment every night. I haven't experienced any problems using this and as it's such a thick balm I like to apply a good layer of this at night before I go to bed so it can work it's magic while I sleep. 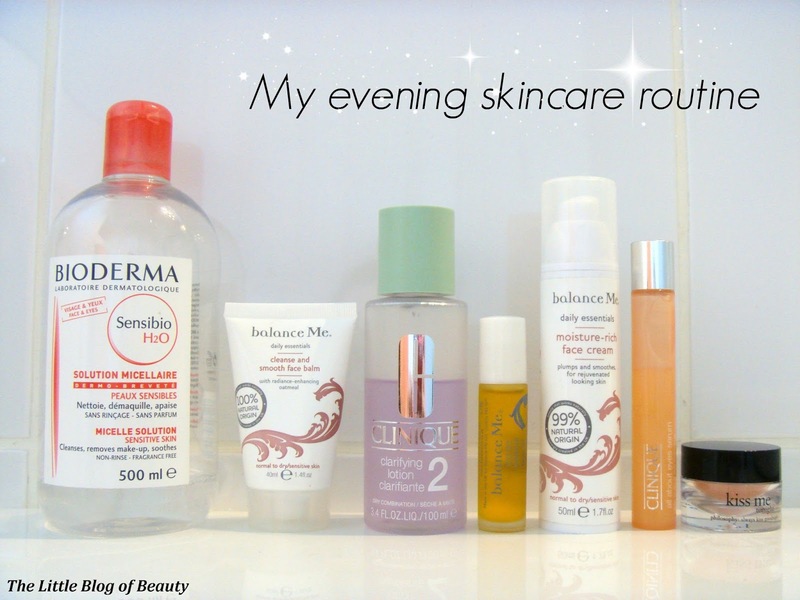 Do any of these products feature in your evening routine? I've had the same problem about face oils, I thought it would make your skin more oily and prone to breakouts etc. Maybe I need to go and try one myself to see! I'd love to try Bioderma! :) I've heard such amazing things about it. These all sound like great products! I really want to try Bioderma! I wish it was sold in Boots and Superdrug. Bioderma looks like something I'd need! I don't have much of routine at night other than brushing my teeth- I usually take make up off as soon as I get home from uni but just with water and some make up wipes and I don't think it's very good. I love reading about people's different skincare routines - I'm trying to get a new one myself at the moment so its good to compare :) Still haven't tried bioderma but am going to Paris in a few weeks so hoping to pick some up then!